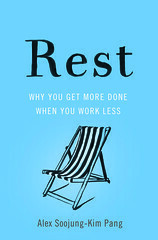 My new book Rest: Why You Get More Done When You Work Less is available at your local bookstore, on Amazon, on Barnes & Noble, and elsewhere. It’s published by Basic Books in the United States, and Penguin Books in the UK (as part of their wonderful new Penguin Life series). It’s also been translated in a number of other languages, including Arabic, Chinese, Dutch, Japanese, Korean, Spanish, and Turkish. I also have a masterclass on “The Power of Rest” on the Calm app. Here I’m collecting links to promotion-related activities, articles about the book and deliberate rest, reviews, as well as information about talks, interviews, radio shows, and other media appearances. I’m also continuing to collect research and stories about the subjects I cover in Rest: stories about the role of deliberate rest in creative lives, research on the neuroscience and psychology of creativity, the challenges of busyness and overwork, and so on.